IMIII hard copy books are on the way! They are in trucks headed for the SUHSD and should arrive at school sites by next Friday (10/23). Parent Guides for courses IM7-IMII (in English and Spanish) are available now on cpm.org. 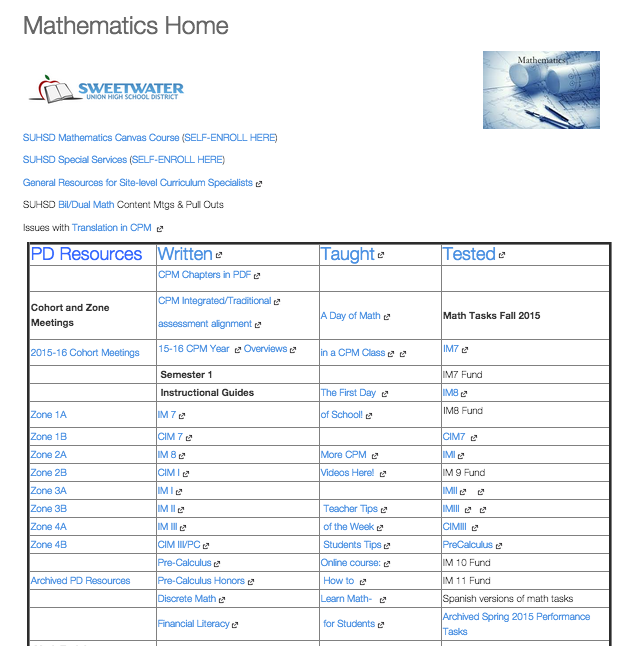 They offer parents an overview of the math topics that are in each course, along with examples and extra practice. Free to download! 2014-15 Math Final Exams (IMI,IMII,IMIII,Math Analysis) have been released to assist with Final Exam creation this year. See below for more information! 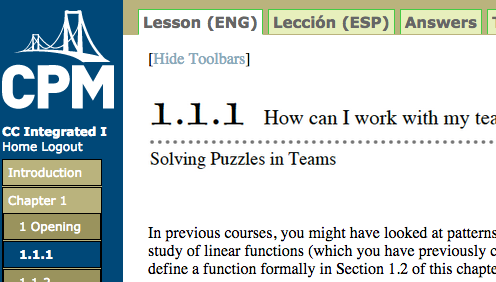 See tab at top of page for Spanish versions of IM7, IM8, and IMI lessons. Similar tools are on the way for other courses. 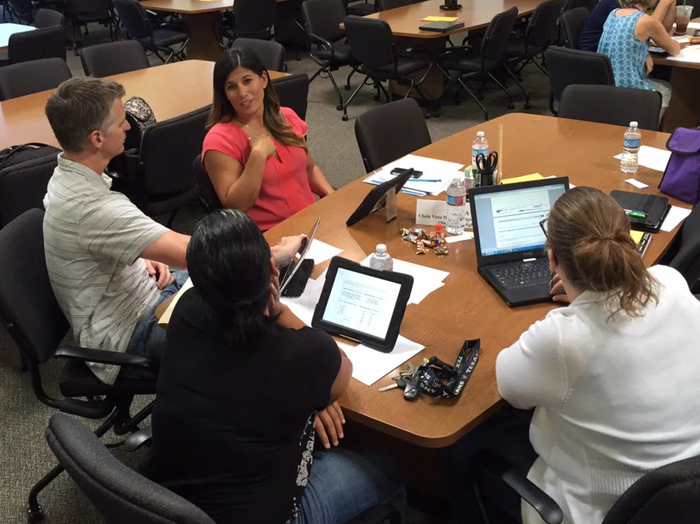 Visit SUHSD Curriculum & PD Canvas Course ("Tested" Curriculum) to access semester 1 tasks. These tasks were selected from CPM material, with the main purpose being to collect formative data on student skills such as problem solving, communicating reasoning, and modeling. 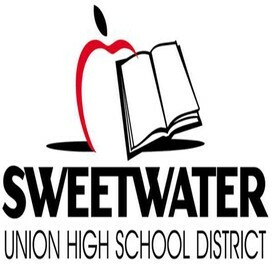 Site leaders will work together to arrange task administration details; teachers should plan to bring unscored student work to Q2 zone workshops. Always verify workshop details by referencing the SUHSD PD Calendar. Access Semester 1 Math Tasks Using the Links Below. 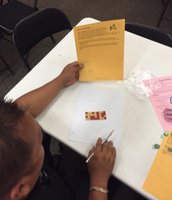 Teachers, plan to bring student work to the second quarter zone workshops in October. The scoring guide is consistent across tasks; teachers should NOT score student work before bringing it to zones. Printing Tip: Be sure to download files before printing in order to preserve formatting. Spanish-language tasks are on Canvas; contact Ivette Sanchez-Gutierrez if you have questions or need more information. 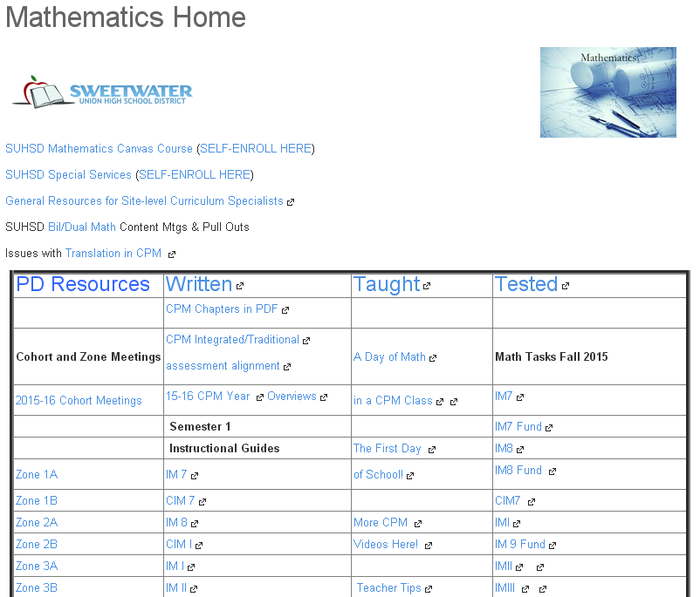 Tasks for students in Fundamentals math classes are also on Canvas; contact Carla Jacobs if you have questions or need more information on those. This year, teachers across content areas are given the option to use the 2014-15 version of the district final exam OR use a PLC-created final exam. 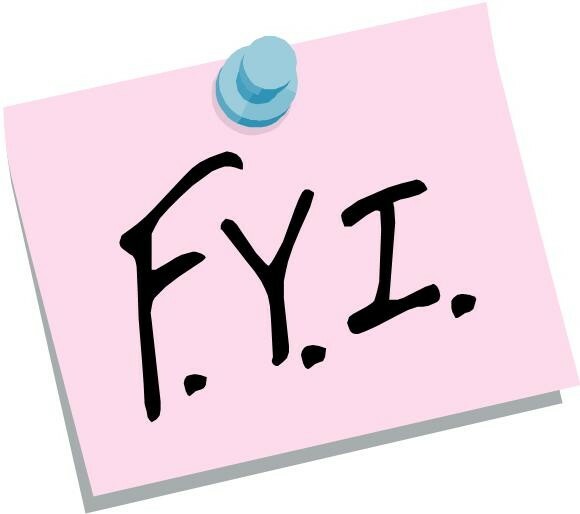 Due to the high school adoption of CPM this year, some 2014-15 Fall and Spring final exams no longer align with the way the curriculum is organized by semester. As a result, certain final exams have been released (in Microsoft Word format) to assist PLCs with their exam creation this year. The intent is to allow these PLCs ( that do not have a final exam that is aligned to the 2015-16 Instructional Guide) to use these past exams as a resource to build their own site-based final exam. To access these released exams, visit the SUHSD Curriculum & Professional Development Course on Canvas. 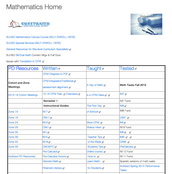 On the Math home page and look for "ARCHIVED TESTED CURRICULUM." Other resources on Curriculum & PD Course: Find instructional guides, assessment and instruction resources. 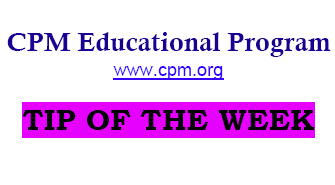 Recently added: Report Issues with Spanish Translation in CPM using the link at the bottom of the "Written" Curriculum column. 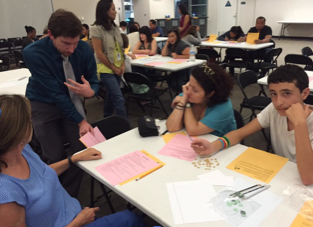 Olympian High School Math Site Specialist Melody Morris organized a Family Math Night on September 17th and over 80 people attended. Many parents/guardians brought OLH students and their siblings to the Family Math Night. All worked together on a problem accessible at various levels. A significant amount of time during the evening was devoted to "doing math:" participants worked in groups to investigate a dimensional analysis problem. Participants worked to create multiple representations of a situation that could occur in "real world" contexts. See these slides. Big thanks to Melody and OLH for sharing their work and ideas! See these resources from Everyday Mathematics, based at the University of Chicago. See this example for IMII. The structure of the evening could be replicated to meet the needs of other content areas. Comments from older siblings in attendance validate the relationship between greater engagement and learning. San Diego Women's Hackathon @ CSUSM is a 12-hour semi-annual event open to all female high school & college students, who work collaboratively to design a website, game, or mobile app that addresses a selected real world challenge. No prior programming experience is required & registration is free. UC San Diego’s Mentor Assistance Program (MAP) is a new campus-wide program, which will engage high school students in a mentoring relationship with an expert from a vast array of disciplines, from History, Marine Physical Sciences and Nanoengineering to Biochemistry, Pharmacology, Athletics and Computer Science. 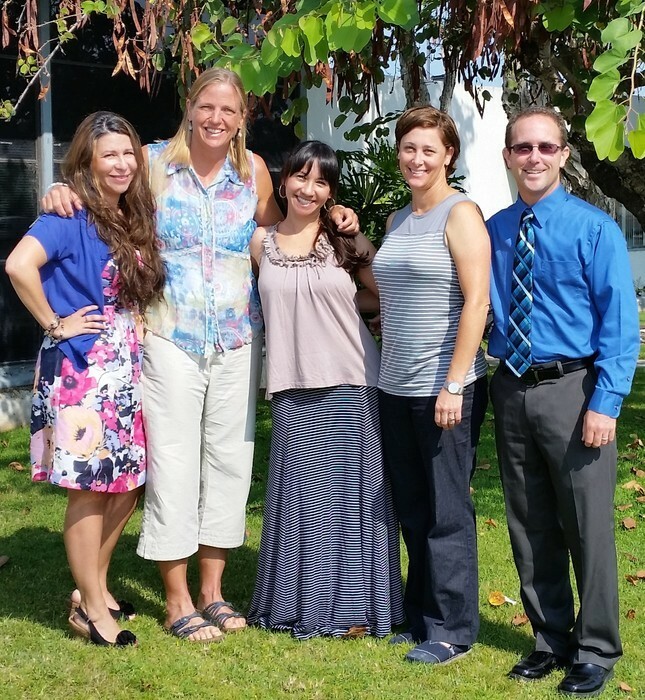 MAP’s mission is to provide a pathway for student researchers to gain access to UCSD faculty, post doctoral fellows and staff to mentor students in their own field of interest (i.e. independent study, class projects or Science Fair projects). Students may choose to communicate with a mentor over email or may indicate their interest to visit the mentor’s lab or work environment. MAP is an opportunity for students to take the first step into a potential career path. MAP students will build an early foundation for success in their academic career. Effective circulation techniques are essential to effective teamwork. Make your circulation purposeful with a specific path mapped out and a specific plan for each pass. 1st pass: Move around to make sure that everyone is on task and following directions. Do not answer questions except those that help teams begin their work, primarily clarifying questions. Do not check homework. 3rd pass: Ask/answer questions to help students complete the task. ** Listen carefully to student thinking and encourage them to move on to the next problems or extend their thinking. 4th pass: Continue listening and asking questions that help students correct any errors you note. Ask higher order thinking, extension or reflective questions. 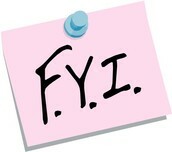 As you circulate, always be on the lookout for errors or misconceptions. Be sure to continually check for understanding and offer positive reinforcement. Design your routes so that you visit every side of every study team. Follow varied routes and stick to them. Don’t allow yourself to be pulled off course by teams that try to rely on your assistance instead of listening to each other. Most teachers find it helpful to carry around an answer key or pages from the teacher edition when circulating. Do not carry a writing utensil with you. You do not want to find yourself doing the problems for the students. If you want to model something, find another student in the team or in the class who has done a step correctly and have them show the student or team the work they have done. **When circulating and asking clarifying questions, feel free to restate the discussion points to add to the discussion. Encouraging students to reread the discussion points aloud to the team is a great way to get the conversation going. Remember that everyone on the team needs to agree to questions, and your response is best when it is a question that helps them answer their own question. Obviously some clarifying questions simply need to be answered. Teachers, talk with your Site Curriculum Specialist about attending along with your PLC colleagues! 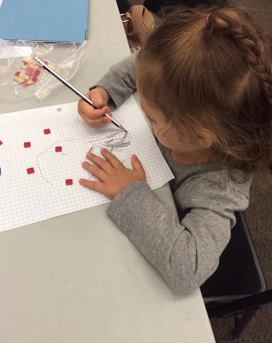 Inside Mathematics - Variety of performance-like tasks for grade 2-12 aligned to the CCSS, with supporting videos, rubrics and additional teaching resources. Mathematics Assessment Project - Variety of performance-like tasks for grade 6-12 aligned to the CCSS, with supporting, rubrics and additional teaching resources. Information about formative and summative assessments. Illustrative Mathematics - Dedicated to supporting mathematics teachers in the implementation of CCSS. Problems created to illustrate standard clusters. 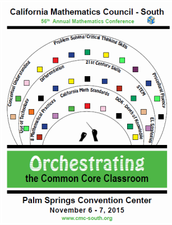 Tools for The Common Core Standards - Website/blog of Bill McCallum, lead author of the mathematics CCSS. Learning Progression papers can be found on this site. Institute for Mathematics and Education - Information and links to other sites. 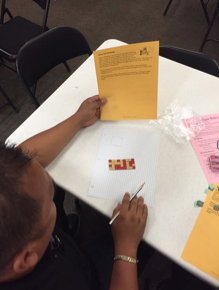 California Mathematics Project – CaCCSS Resources - Information from content-based task force groups. Site is under development but has some good resources.